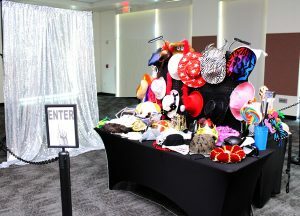 Hundreds of Props – Hats, Boas, Sunglasses, Mustaches on a Stick, the largest selection of props anywhere. Beautiful Backdrop – Stunning, silver sequin background provides a great backdrop for your selfies. Selfie Lights – Clip on Selfies lights to enhance your pictures. On-site Attendant – We setup and manage the Selfies & Props Station so you don’t have to. Affordable – Rentals start at $195.